The order is for additional units of EMILY 3000, portable JENNY 600S, and SFC Power Manager 3G. The fuel cell products are used as off-grid power source for additional defense applications in Asia. The total order amount is approx. EUR 1.8 million. Brunnthal/Munich, Germany, March 21, 2018 – SFC Energy AG, a leading provider of hybrid power solutions to the stationary and mobile power generation markets, announces the receipt of a follow-up order by an Asian customer. Following last year’s success, the customer placed a significant follow-up order for units of SFC Energy products for new defense applications. The total value of the follow-up order is approx. EUR 1.8 million. A first shipment happened in December 2017, completion is expected by the end of March. SFC’s EMILY 3000 and JENNY 600S fuel cells and the SFC Power Manager 3G are used to reliably power off-grid border protection equipment, electrical equipment, and mission-critical communication systems to some extent at very remote outposts. The key benefit of the fuel cell for the customer is a significant reduction of fuel consumption that leads to a major weight reduction compared to conventional diesel generators and batteries. This enables significantly easier fuel logistics in difficult to access regions, with much reduced operating expense. The fuel cell products are easy to use, maintenance free and feature 100% reliability even under extremely harsh climatic conditions. 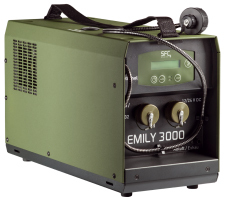 The EMILY 3000 fuel cell is a silent, environmentally friendly mobile energy source for electrical devices in command and multipurpose vehicles, and for fielded and stationary power in field outposts. In combination with the SFC Power Manager 3G, the man-portable JENNY 600S fuel cell supplies parallel power to different voltage devices and recharges batteries at the same time. Additional information on the SFC Energy’s off grid power portfolio for defense, security & safety, oil & gas, wind, traffic management, environmental and telecommunication applications at www.sfc-defense.com, www.efoy-pro.com and at www.sfc.com. SFC Energy AG (www.sfc.com) is a leading provider of hybrid solutions to the stationary and portable power generation markets. SFC is a major supplier of methanol fuel cells, with over 41,000 methanol fuel cells sold to date. The Company has award-winning products and serves a range of applications in the Oil and Gas, Security and Industry, and Consumer markets. The Company is headquartered in Brunnthal/Munich, Germany, operates production facilities in the Netherlands, Romania, and Canada. SFC Energy AG is listed on the Deutsche Boerse Prime Standard ((GSIN: 756857 ISIN: DE0007568578).